The holidays are upon us, which means it's time to get moving with your marketing campaigns. People start their holiday shopping early. Like Halloween early. But with so many sales, gift guides, "pick me" promos, and giveaways, how can you make sure customers choose YOU? With the majority of annual sales going down during the holiday season, you can't afford to miss the boat (or shall we say Black Friday, Cyber Monday, and holiday gifting madness). So, to kick your butts in gear, we've whipped up this nifty infographic that will have you banging out holiday marketing campaigns faster than you can DIY that ugly Christmas sweater. Follow our holiday marketing guidelines for sweet, sweet success. 1. Start early. People are shopping earlier than ever before. Last year, many brands received less traffic and sales because they only concentrated on the key calendar holidays (Black Friday, Cyber Monday, etc. ), as opposed to starting early like those brands who thought ahead of the pack. 2. Don't ignore digital! Most brick and mortar stores think they're good to go because people will just find them, but truth be told...shoppers do their research online before venturing out to make purchases. Whether you're a brick and mortar or online shop, being found online is crucial. 3. Influencers (not that I'm biased) are the wave of the future, and the way to go when planning your holiday marketing. No one looks at banner ads anymore. And more importantly...200 MMMMillion people are using ad blockers. So your hard-earned money is never even seeing the light of day. 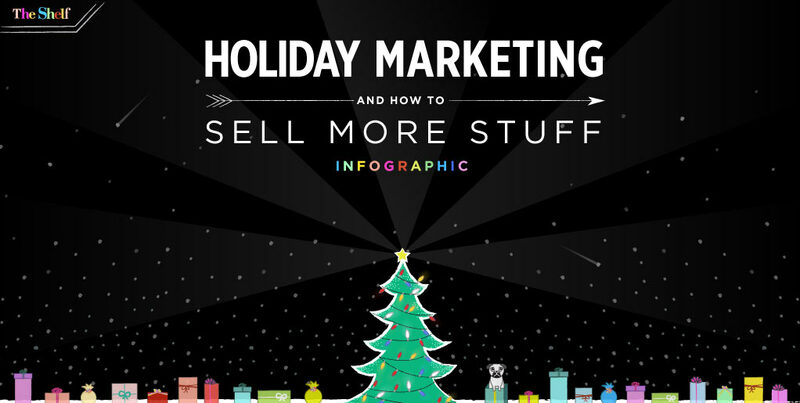 Our infographic has everything you need to get a handle on holiday marketing stats, best practices, and creative ways to sell more stuff. Hope you enjoy! And if you like it, we'd love it if you'd share it with your network. There's an embed code at the bottom if you'd like to use it on your own blog (sharing is caring)! So, there you have it. Here's a a little snippet of code for you to stick this massive beast of holiday statistical goodness on your own blog (if you feel so inclined). And, if social media is more your thing, feel free to use the image on the right in your tweet or post! Visuals are fun and they typically get TONS of engagement. So just to wrap up this joyous infographic...the holidays basically negate the saying "money doesn't grow on trees". It can. You just need to grab the low-hanging fruit. The best way to do that? Jump on those holiday marketing campaigns NOW and partner up with influencers in your industry who can spread your sparkly message far and wide. And for all you holiday-stat seekers, we have tons of interesting data to share with you. Pop on over to our Press Page for all the dets!